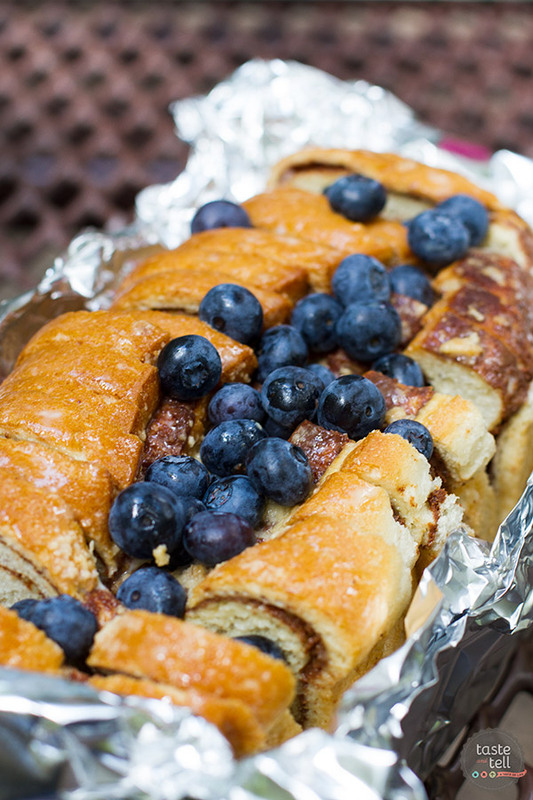 Breakfast while camping doesn't have to be complicated – this Campfire Cinnamon Blueberry Bread Recipe is proof of that! Reminiscent of a baked French toast, your mornings in the woods will be delicious! 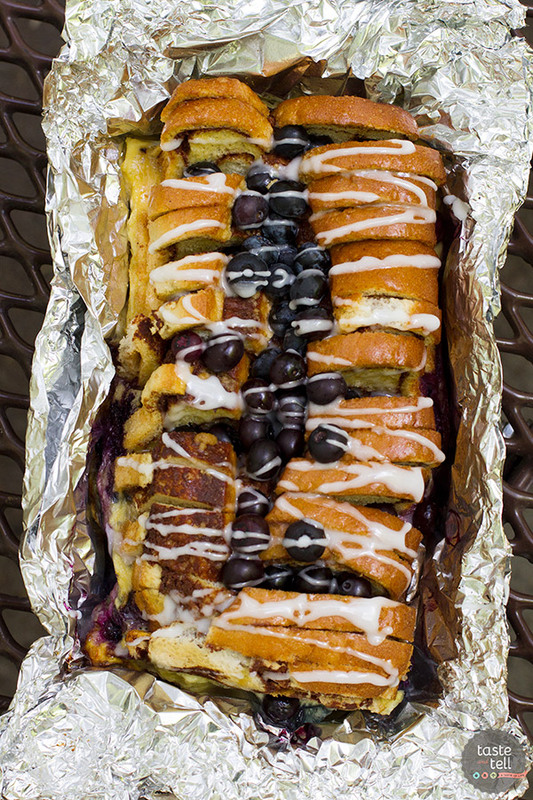 Last week, I wanted to go up and test one more recipe to bring to you all this summer – this Campfire Cinnamon Blueberry Bread Recipe. But the day we went to go up, my husband was sick. I did consider just making this on the grill or in the oven, but I needed to make sure it would work over a campfire. So I decided to just go by myself with the kids. It's not very far, and the kids were in desperate need of an outing outside of the house. So I packed up, and we all jumped in the car. All was well until I went to start the campfire, and I realized that I never start the fires. My husband always does it. My mind thought back to that dreadful camping trip in high school and I had a mini panic attack, wondering how I was going to get my fire to actually cook the recipe. But I took a deep breath and got to work. I will admit that I was a little worried for a bit, because there was a little bit of wind and I was afraid it was going to blow out my fire before it really got going, but you guys – I did it. I built that fire, and it was a great fire. The kids roasted marshmallows, I made this delicious Campfire Cinnamon Blueberry Bread Recipe, and the fire was hot and perfect. I will not refrain from saying that I was proud of myself. 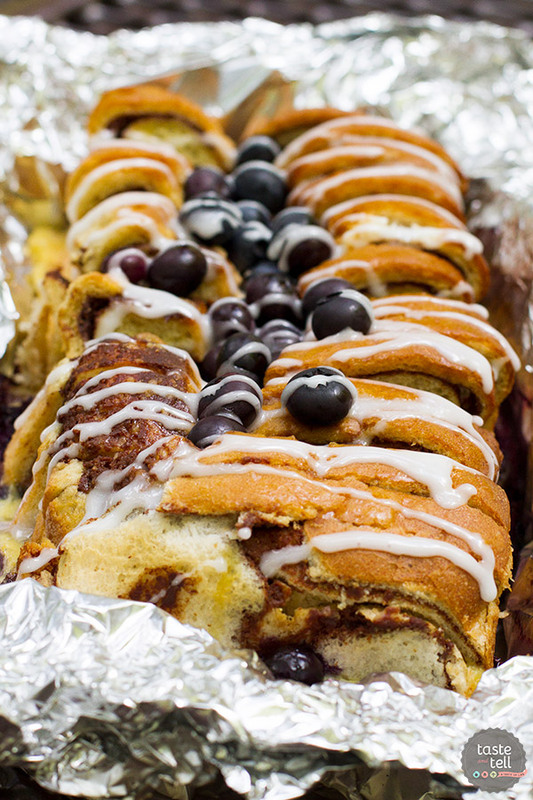 We totally didn't eat this for breakfast, (since we weren't even technically camping), but this Campfire Cinnamon Blueberry Bread Recipe would make a perfect camping breakfast. It's pretty easy, and it tastes great. 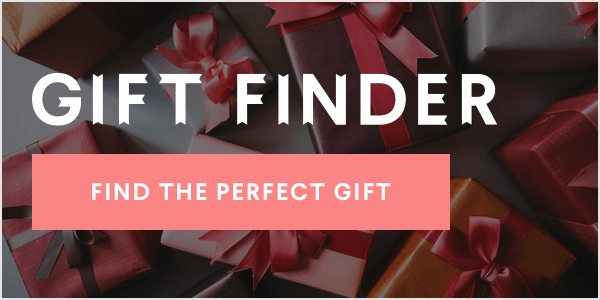 If you are a fan of baked French toast, you'll love this recipe. It starts with a loaf of cinnamon bread. I just used a loaf of cinnamon swirl bread from my grocery store's bakery, but you could use cinnamon raisin bread, as well. I mixed up the eggs, milk, cream, maple syrup and vanilla and put it in a bowl with a lid before we left the house. That way, I just had to pour it over the bread when we needed to. I think the biggest tip I can give is to make sure you separate the slices of bread slightly and make sure the egg mixture gets in-between each slice of bread. And make sure you tuck the blueberries down in there as well. Some of the egg mixture will accumulate at the bottom, but if you make sure you pour the mixture between the slices, it definitely helps. You'll also want to make sure you have a knife, because you'll need to slice the bread again (especially at the bottom) after it cooks. We didn't have a knife with us, and we ended up just pulling it apart with our hands. Which worked, but it wasn't very pretty, which is why there aren't any photos of the bread out of the foil. I used a campfire grill like this one to put over my fire. Serve up the slices with a sprinkling of powdered sugar or a drizzle of maple syrup, and you have a great camping recipe. I know I want to go camping before it gets cold just so I can make this again! Prepare a campfire and let it burn down to coals. Lay 2 large sheets of heavy duty foil on top of each other. Spray with nonstick cooking spray. Place the loaf of cinnamon bread in the center of the foil, and fold the edges up around the bread, forming a sort of bowl. Spread the pieces of bread apart. In a bowl, lightly beat the eggs. Beat in the milk, cream, maple syrup and vanilla. Pour the mixture over the top of the bread, making sure the mixture goes in-between each of the pieces. Sprinkle one cup of the blueberries over the bread and press most of them between the slices. Use another sheet of foil to cover the top of the bread, and crimp the edges to seal. Place the bread on a grate over the hot coals. Grill until the egg is cooked through, about 30 minutes, rotating the bread to avoid hot spots. 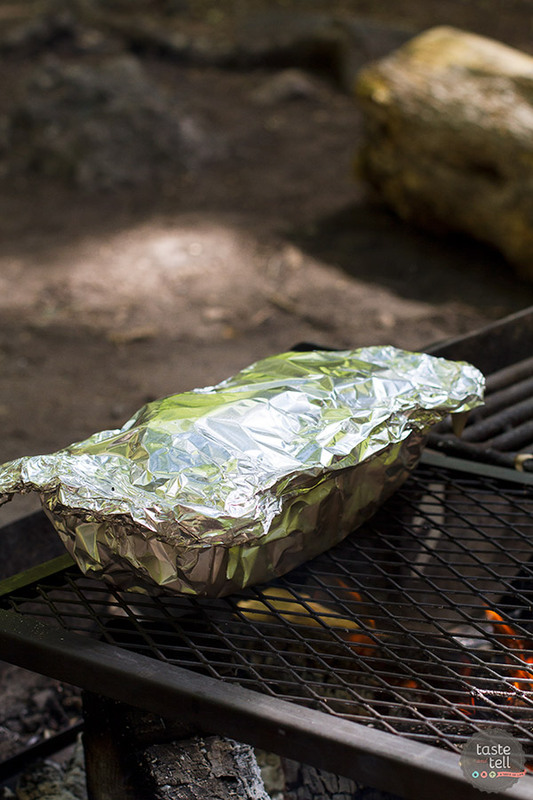 Remove from the heat and allow to stand (still in the foil) for 10 minutes. Combine the powdered sugar with the 1 tablespoon of the cream in a ziplock bag. Add more cream as needed to make a glaze. Cut the corner off the corner of the bag and drizzle the glaze over the top of the bread. 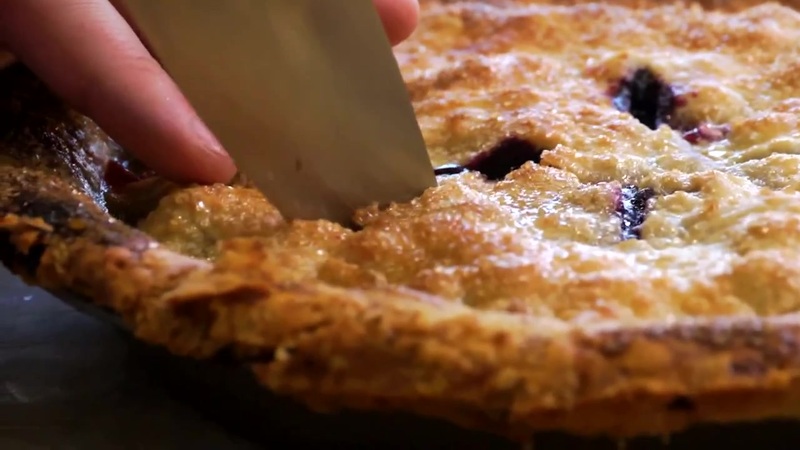 Serve sprinkled with the remaining blueberries and powdered sugar or maple syrup.